Soi Cowboy is a street in Bangkok named after an African American hat-wearing man who opened the first Go-Go bar in the city in the 70’s. 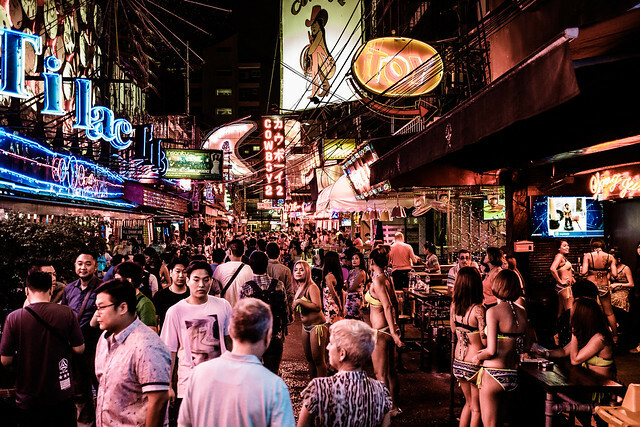 This red light district of Bangkok is known for sheer entertainment nightlife and Go-Go bars, people visit Soi cowboy for various reasons - neon glowing attraction for the pure entertainment of dancing girls drinks and music all at one place. You’ll never get to see anything like this anywhere else in the world. There are more than 20 or so Go-Go bars side by side. If you have not been here don’t be shy and give it a try. Soi Cowboy is located between Sukhumvit Soi 23 and Asoke road. Best way to reach Soi Cowboy is to hire a tuk-tuk. Soi Cowboy has lot of options so you have to pick which bar you want to explore. Once you step in you’ll find red lights brighten up the entire street. Ladies standing in front of the bar wearing revealing clothes some resting, eating or doing their work. Entrance to the bar is free and drinks cost 100-200 baht depending upon which bar you chose. Staffs will encourage you to buy drinks and girls here are pretty open in nature.